Yamaha YDP 103 Digital Piano - is this piano any good? Do you want a digital piano, but don’t have a lot of money to spend? Do you only see digital pianos with more features than you would ever need? If the answer is yes to either of these questions, then you need to continue reading this review. In this article we will look in depth at the Yamaha YDP 103. 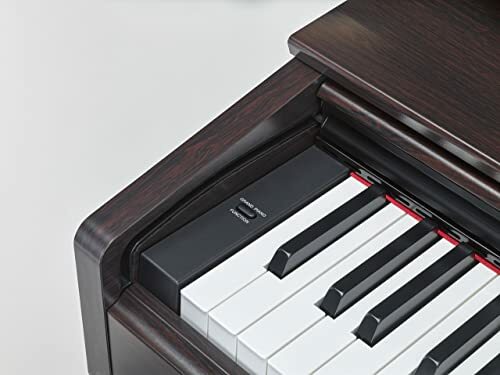 This digital piano is part of Yamaha’s exclusive Arius series of digital pianos. However, it is a stream-lined version that is more affordable than its counterparts. Read on to learn more about the Yamaha YDP 103. You can also check out our articles here and here for more affordable digital piano options. When you begin your search for a great digital piano, you need to start with some specifics. These specifics will help you differentiate the Yamaha YDP 103 from other similar products. In addition to the Yamaha YDP 103’s specifics, it has a number of features that set it apart from the competition. All of Yamaha’s Arius digital pianos come with iOS compatibility. With a standard USB chord, you can hook up a computer or mobile device to the piano. Once you have hooked up your device, just download the Controller app, and you will be ready to go. Yamaha’s “Digital Piano Controller” app provides extra functionality for your YDP 103. With the app you can adjust the keyboard’s setting, change voices, and record yourself playing. It is hard to find this number of digital features in other pianos in this price-range. The recording feature of the “Digital Piano Controller” app is especially interesting. It allows you to record up to two different tracks. This allows you to record your right and left hands separately. If you are having trouble with one line of a song, the recording feature is here to help. The Yamaha YDP 103 comes with a graded hammer standard (GHS) keyboard. The GHS system aims to mimic an acoustic keyboard. It requires a heavier touch at the low end of the keyboard and a lighter touch at the high end. As strange as it seems, this is how an acoustic keyboard is typically set up. The Yamaha YDP 103 keyboard is comprised of a special matte finish on the black keys. The matte finish is designed to wick away moisture and create a stable playing surface. Practice as much as you want, the keys will never get wet. Yamaha’s YDP 103 does not include the synthetic ivory key tops of the more expensive models. However, the GHS keyboard ensures a realistic playing experience. The keyboard on the Yamaha YDP 103 is designed to improve your finger technique. Finally, the feature that most musicians care about: the sound of the Yamaha YDP 103. Like the digital pianos in the Arius series, the YDP 103 comes with ten voices. These voices come from Yamaha’s wide range of instruments and pianos. So, you know that you are going to sound great with the Yamaha YDP 103. Yet, the YDP 103 does not have all of the sound capabilities of some of the other Arius digital pianos. First of all, it only has sixty-four polyphony. This means that each note will ring much less and sound less rich than on other products. Secondly, the YDP 103 songs not come with the Pure CF Sampling. Instead, Advanced Wave Memory Stereo Sampling recreates the sound of sampled instruments. This is still a great system. However, it is not as advanced as the Pure CF Sampling found on the other Yamaha Arius digital pianos. Think the Yamaha YDP might be for you? Keep reading to find a breakdown of its top pros and cons. Your purchase of the Yamaha YDP 103 is backed by Yamaha’s brand name and storied history. You always know that you’re getting a great product with a Yamaha. Plus, Yamaha’s is known to have great customer service and warranties. If you have any problem with your product, just contact them and they will get it taken care of for you. Of all of Yamaha’s Arius digital keyboards, the YDP 103 is the most affordable. What you give up in features, you more than make up for in the cost. This product is perfect for someone new to piano playing. 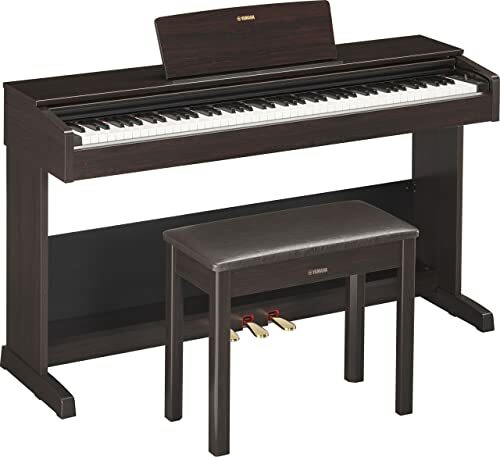 Someone who wants to try playing before they commit to a more expensive digital piano model will love the Yamaha YDP 103. The YDP 103 comes with a dual mode. This unique mode allows you to play in two voices simultaneously. For example, you can play in both piano and string voices. So, if you are someone who likes to experiment with what a digital piano can do, the Yamaha YDP 103 is for you. The Yamaha YDP 103 is not a portable keyboard. It weighs approximately 116 pounds, so it cannot be moved easily. So, if you want a piano that you can take to gigs, check out this article. The YDP 103 is smaller, with less features than the other Arius digital keyboards. Therefore, you miss out on some of the aspects of the other products, like more polyphony and Pure CF Sampling. But, people that don’t mind a “stripped-down” model, will love the Yamaha 103. 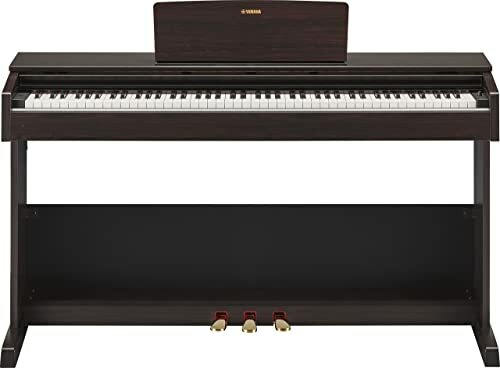 Yamaha’s YDP 103 may not have all of the features of some of the company’s other digital pianos. However, it is a perfect starter instrument. Also, it is a good instrument for a person who just wants to play music; not mess with extra features. Finally, the Yamaha YDP 103 will look, feel, and play like the “real” thing. This makes it a great option for anyone looking to improve their piano technique. The keyboard itself makes you a better player just by using it. How cool is that? Do yourself a favor and try out the Yamaha YDP 103 today.